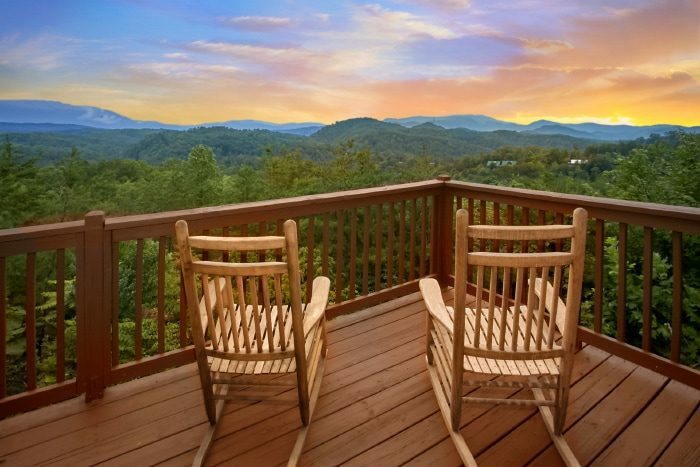 See for miles and miles when you stay at "Eagle's Crest!" 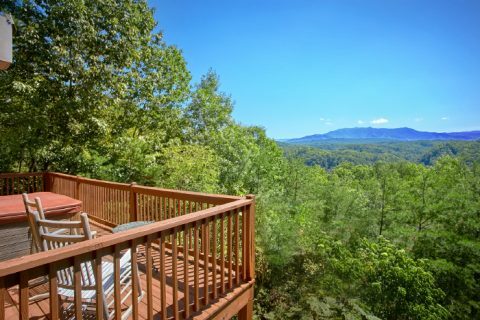 This beautiful 2-bedroom cabin with a theater room rests in the mountains above Pigeon Forge in the Upper Middle Creek road area. This popular vacation cabin community is well-known for placing guests only minutes away from Dollywood Theme Park. 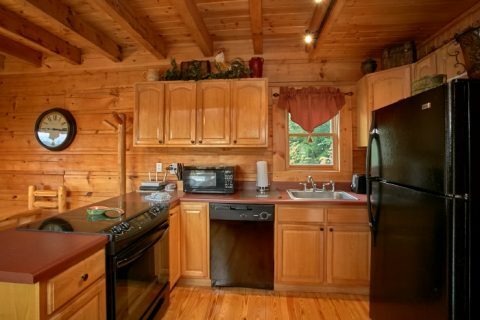 In fact, this particular cabin is only 3 miles away from Dollywood! 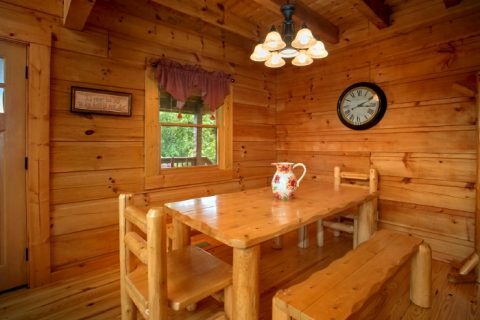 With unforgettable mountain views and an excellent location only minutes away from the top destinations in the Smokies, this log cabin is ideal for families searching for the best vacation experiences. Step into the main level of your rental and you'll find an open floor plan that features a comfortable living room, kitchen, and dining room area. 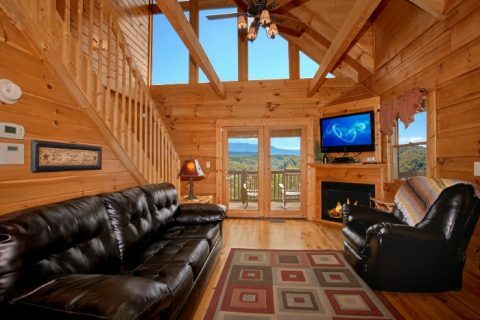 The living area features comfortable furnishings, a gas fireplace, 42" HDTV, deck access, and large windows that let you admire this cabin's awesome view. 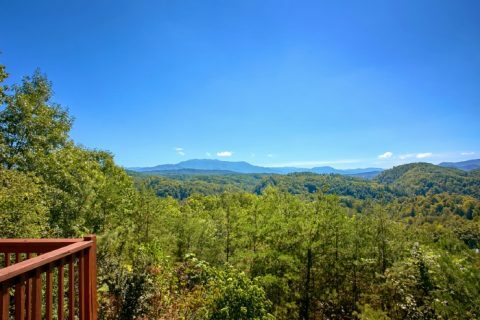 Even though this rental provides beautiful mountain vistas, this cabin is accessible by paved roadways that are easy for guests to navigate. The sleek, modern kitchen comes complete with everything needed for making delicious, cost-effective meals to enjoy with your family at the dinner table with seating for 6. 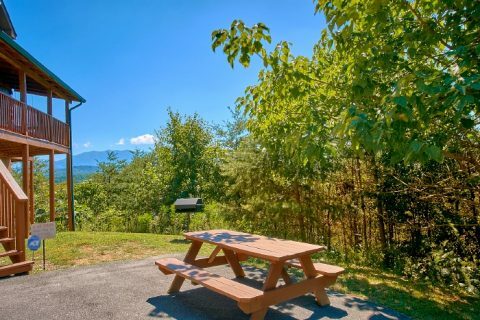 Another great option for dining in your cabin is the charcoal grill and picnic area in your rental's yard that's ideal for enjoying meals surrounded by Smoky Mountain beauty. 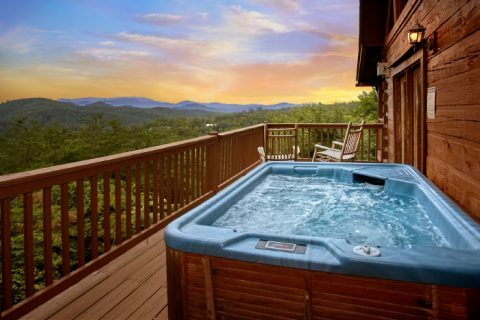 Outside on your cabin's deck, be sure to take advantage of the 6-person hot tub and porch swing that are both ideal for relaxation. 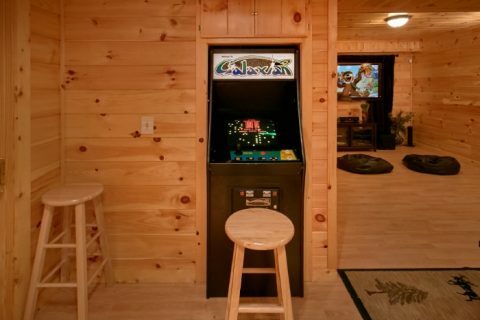 For great in-cabin entertainment, your rental comes complete with a theater room and arcade game on the lower level. 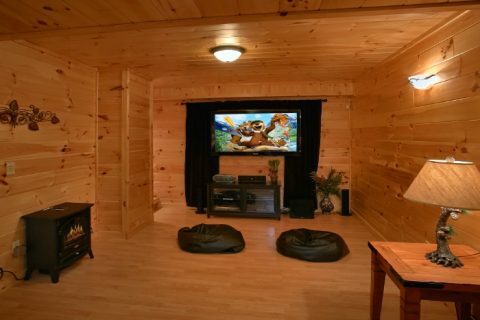 This room offers a movie theater experience thanks to a 58" Plasma HDTV, surround sound, Blu-Ray, and a sectional sofa. The arcade game is a sit-down console that features 60 classic arcade games to enjoy. 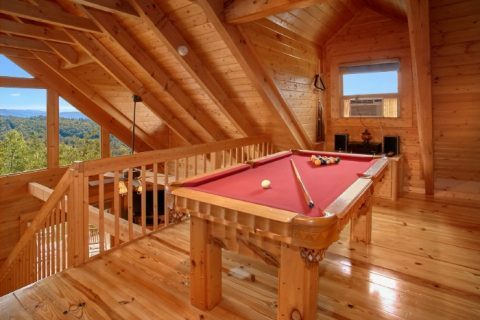 Upstairs, you'll find the game room with a pool table and stereo perfect for holding a pool tournament with your family. 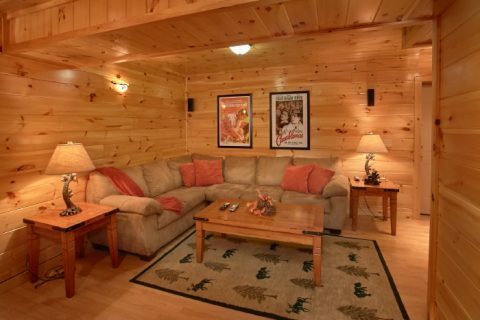 You can enjoy streaming your favorite movies and music with this rental's WiFi Internet access. So guests can get a good night's sleep, this rental comes with two bedrooms. 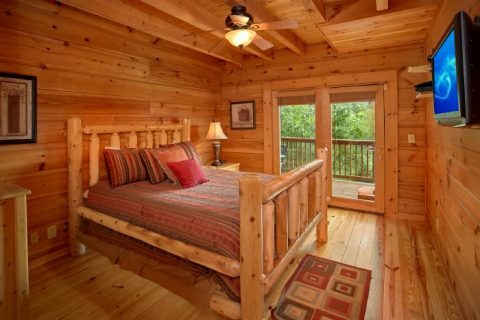 The main level offers a queen bedroom with access to the main deck. 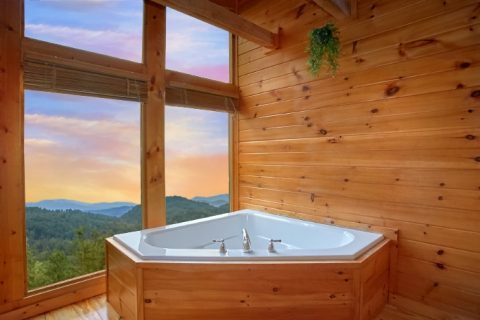 Upstairs, a king-size bedroom boasts a full bath, 32" television, jacuzzi tub, and a full bath. 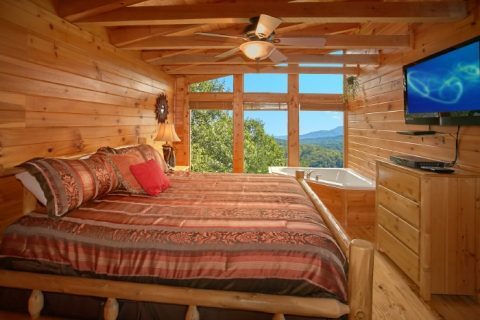 Don't forget to book this luxury cabin close to Dollywood with Cabins USA Gatlinburg to save 15% on your nightly rate! 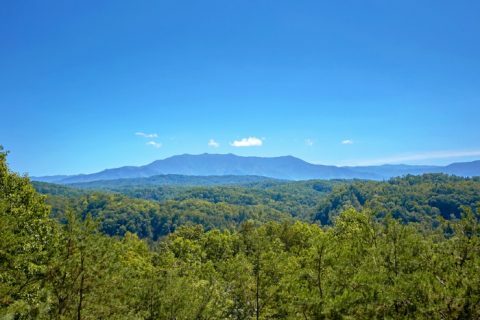 Experience the natural beauty of the Smokies and the best local attractions during your fantastic Smoky Mountain vacation!